She needed 7 sets, so I made 8, so that I could give one set to her. I spent Thursday making these sets of cards, which she will need first thing Friday morning as the volunteers start their final weekly shifts before our winter break. 1) Start with Stampin' Up! 's precut 3.5x5 notecards - they come in sets of 20 with matching envelopes. They are made of Whisper White, which I generally find to be quite flimsy, but in this small size, they're pretty good. This reduces cutting time. 2) Make 8 each of 10 designs. This reduces design time. 4) Make the designs one-layered. If you want the card recipes, click here to go to my splitcoaststampers gallery, where I've listed all the supplies used. Every single one looks fantastic! These are fabulous! So professional. These are awesome...I'll be coming back here for more inspiration on these one layer beauties!! And...uh oh...I'm write there with you on the last bullet! Wow Ardyth! what a project! wonderful CAS designs on these pretty Thank you's - I'm sure they will be appreciated! Okay. Wow. This falls into the category of generous. Thank you, Ardy, SO MUCH for giving us SO MUCH card inspiration in one posting!! My my you have been busy. All these cards are fabulous. But what else did I expect. Goodness, Ardyth! I'm amazed that you have done all these cards and they are all fantastic. Besides that, you comment on everyone's blogs and are on so many design teams. You are amazing and I'm beginning to think you never sleep! 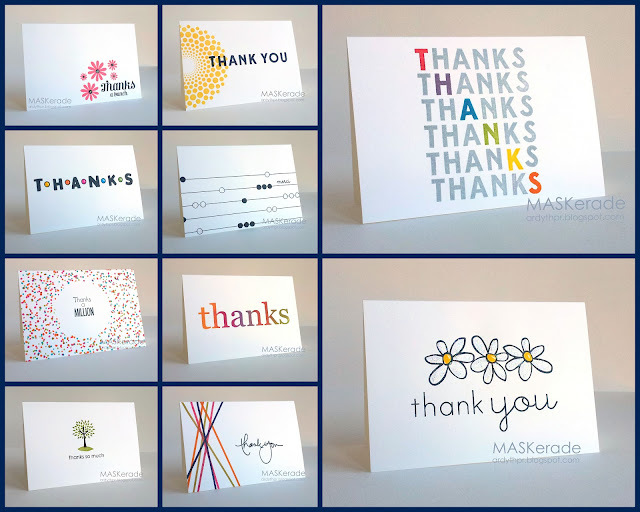 These are all wonderful, and how nice of you to make so many thank you cards. Each one is different but they are all CAS perfection. You amaze me! I'm wondering the same thing as Bonnie...do you ever sleep? I love how you presented these photos! How did you make the grid? Looks great! oh my, I have to pin this. I have to say it's not a very useful gift though. How could they send one of these? They would all have to be hoarded! These are awesome! Every single design is beautiful! Love the clean and crisp look. wow. wonderful cards! I love the "thanks" one where It forms thanks down the middle of all the "thanks" Amazing!